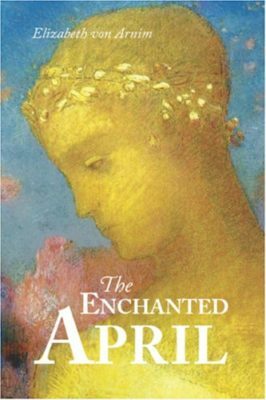 This month the Sparkling Vintage Ladies’ Reading Circle is reading, appropriately enough, The Enchanted April by Elizabeth von Arnim. I’ve not read this book before, although I’ve seen a movie version a few years ago (there have been at least two films made of the story). The book was published in 1922 and follows four women who leave the dismal early-spring weather of Britain for the sunny climate of Italy. Strangers to each other, they’re joined by the common purpose of renting a villa. I’m looking forward to reading about four distinct characters and how they change and grow during their sojourn together. I hope I’m not disappointed. Come join us if you’d like to talk about the book. Today I’m looking out on a gray, wet, chilly day. The idea of a vacation to somewhere warm is very appealing at the moment. The Enchanted April takes place in Portofino, which sounds appealing. But if I could choose any warm destination in the world, I think I would choose the south of France. I spent one day in Biarritz, long ago, but it was rainy and cold in the off-season. I think I would like to see it again in all its summery glory. If you could whisk away to someplace warm and sunny, where would you go? So sorry I once again could not join the readalong. But I hope to be able in future months.